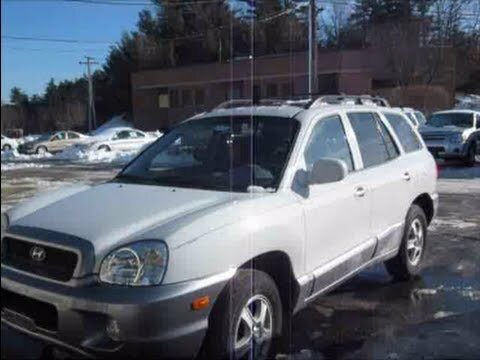 I love my 2004 Hyundai Santa Fe. I bought it second hand from the previous owner in 2015. My vehicle's performance has been stellar, even with adding almost 50, 000 miles since I bought it. The car runs great in all weather including snow and ice; the car accelerates quickly without any problems; and the car typically gets about 25 miles per gallon on average. The Santa Fe has proven itself to be reliable and I always feel safe driving it, in the day or at night. I know some cars are not very comfortable to drive in for hours, but the car is endlessly comfortable to ride in, and I have no complaints in that area. The car has just enough room for me (and a few passengers when needed). The back is extremely spacious, especially when the seats are put down to expand the cargo space. Love this car and I would buy it again and again! Highly recommend for small families. I got this vehicle cheep from a co-worker to drive back and forth to work everyday. For the age and it having 216, 000 miles I have had to put minimal money into it. I drive an hour each way to work. I have a teenage girl that always has something going on I can put as little at 30, 000 miles an as many as 65, 000 miles combined on my vehicles every year. This vehicle has cruse and electric windows and locks only thing to watch out for is if you bump the passenger lock on your way in or out an you will lock all the doors. The passenger lock is not a conventional lock it is the lock it is self. Beside the lock issue this vehicle rides good and drives very well. It seems no matter what my children need to haul we can fit it in. 4 wheel drive. Good gas mileage. Over 300,00 miles and runs great. For a older model car it rides very smooth. It is easy on gas to be a SUV. Very roomy for kids. I have had a problem with my check engine light coming on and on. I try to keep my cars oil changed. To me that is the life of the car. I would recommend any one putting these money in to a Hyundai. My car has over 300,000 miles and is still going. Praying it continues to keep getting my kids and me back and forth. ON CERTAIN SPORT UTILITY VEHICLES EQUIPPED WITH 3.5 LITER V-6 ENGINES, 4-WHEEL DRIVE AND ANTILOCK BRAKING SYSTEMS (ABS), IF THE BRAKE PEDAL IS DEPRESSED AT SPEEDS BETWEEN 3 AND 12 MPH WHEN THE BRAKE PAD FRICTION SURFACES ARE WET, A VIBRATION MAY OCCUR BETWEEN THE BRAKE DISCS AND PADS CAUSING ABS SENSOR ELECTRONIC SIGNAL NOISE TO DEVELOP. AT SPEEDS BELOW 5 MPH, THE ABS SENSOR SIGNAL NOISE MAY CAUSE THE ABS ELECTRONIC CONTROL UNIT (ECU) TO ACTIVATE THE ABS, EXTENDING THE STOPPING DISTANCE. IF AN EXTENDED STOPPING DISTANCE OCCURS, IT COULD RESULT IN A CRASH. DEALERS WILL REPROGRAM THE ABS ECU. OWNER NOTIFICATION BEGAN ON MARCH 24, 2004. OWNERS SHOULD CONTACT HYUNDAI AT 1-800-633-5151. CERTAIN SPORT UTILITY VEHICLES FAIL TO COMPLY WITH THE REQUIREMENTS OF FEDERAL MOTOR VEHICLE SAFETY STANDARD NO. 120, "TIRE SELECTION AND RIMS FOR MOTOR VEHICLES OTHER THAN PASSENGER CARS". THE TIRE PRESSURE LABELS DO NOT CONTAIN THE INFORMATION REQUIRED BY THE STANDARD. OWNERS WILL BE PROVIDED WITH A CORRECT LABEL AND INSTALLATION INSTRUCTIONS. OWNER NOTIFICATION BEGAN ON OCTOBER 29, 2003. OWNERS SHOULD CONTACT HYUNDAI AT 1-800-633-5151.